The oldest women’s Sherlockian society, is based in New York City. Although a few men were given honorary membership in 1991, it was only in 2008, the 40th anniversary of ASH, when men were admitted to full membership. 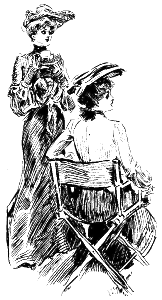 Read about Irene Adler, the original Adventuress. The Serpentine Muse* is the official ASH journal — everyone is welcome to subscribe and contribute articles or poetry of Sherlockian and/or Victorian interest. Founded by a group of women students at Albertus Magnus College in the late 1960s and led by Principal Unprincipled Adventuress Evelyn Herzog, ASH achieved early notoriety when its members picketed the Annual Dinner of the Baker Street Irregulars in protest of the BSI policy of excluding women. For the next 25 years ASH thrived with its own (coeducational) dinner on the same January night as the BSI event. When women were finally invited into the BSI in 1991, selected Adventuresses were among the first to be invested. As more Adventuresses were invited to attend the BSI dinners, the traditional January ASH dinner was replaced by The Baskerville Bash (1997-2006), an event now called The Gaslight Gala. An informal ASH Wednesday dinner and Sunday brunch now bracket the Birthday Weekend in NYC. Other ASH activities include an annual Spring Dinner, an annual Autumn Dinner, and informal ASH Wednesday get-togethers. Four special male Baker Street Irregulars were invested into ASH in 1991, but only one was still living in 2006. That year ASH history was made with M.E. Rich’s announcement that in 2008, the 40th anniversary year of ASH, men would be allowed to make an ASH of themselves. In January 2008, longtime ASH Peter Blau was joined by nineteen friendly Sherlockian men who enthusiastically swelled the ranks of fully-invested ASH. A favorite ASH motto is Ovid’s Gutta cavat lapidem, non vi sed saepe cadendo.